Written in 1991-1912, the concerto was first performed in Moscow on 25 July/7 August 1912, with the composer himself as soloist and Konstantin Saradzhev (8 October 1877 – 22 July 1954, the Armenian conductor and violinist) conducting. 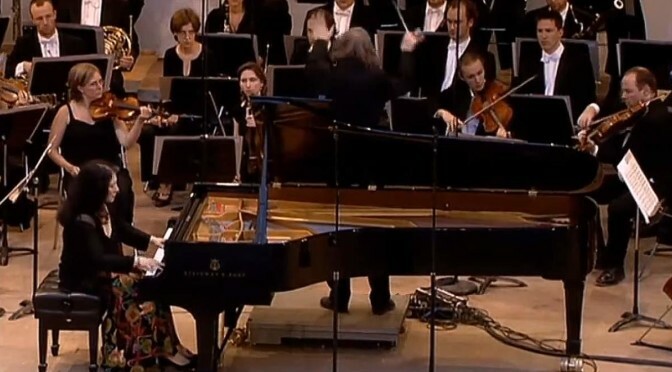 Prokofiev dedicated his first piano concerto to Nikolai Tcherepnin (May 15 [O.S. May 3] 1873 – 26 June 1945) the Russian composer, pianist, and conductor. On 18 May 1914, performing his first Piano Concerto, Prokofiev won the Anton Rubinstein Competition as a piano player at the Saint Petersburg Conservatory on 18 May 1914. The Anton Rubinstein Competition was first staged in Russia between 1890 and 1910, and prizes were awarded for piano playing and composition. Since 2003 it has been run in Germany as a piano competition only. The original Anton Rubinstein Competition was staged by Anton Rubinstein himself every five years from 1890 to 1910. Prokofiev thought he may not win the competition playing a classical concerto and proposed his own concerto for the competition programme. He thought playing his own concerto, the jury would be “unable to judge whether he was playing it well or not.” The rules of the competition, however, required that the piece be published; Prokofiev found a publisher willing to produce twenty copies in time for the competition. The performance went well and the jury, headed by Alexander Glazunov (1865 – 21 March 1936, the Russian composer, music teacher, and conductor) awarded Prokofiev the prize.